Decommissioning is a very large and costly undertaking. Are we developing a national strategy for doing this correctly and effectively? Can we develop expertise within the supply chain that is dedicated and right sized for decommissioning and which is exportable? Are we focusing on the right or wrong areas of work? Are decommissioning projects different from investment projects? In some respects decommissioning projects are similar to investment projects; we still need to work safely while minimising any negative impact on the environment. The contracting strategy adopted for investment projects is very often focused on transferring risk from one party to the other. Project drivers, or values, tend to be schedule and quality, which can be appropriate for capital investment projects delivering production revenues and long life. Decommissioning projects require the same level of decision quality but different values; managing schedule at lowest cost. A risk transfer strategy for decommissioning will not support collaboration, nor achievement of lowest cost; two legal obligations for operators. The use of investment project or operations procurement strategies can lead to the application of inefficient bidding processes, inappropriate frame agreement contracts, and a narrow focus on individual commodity price rather than potential overall value. An example of inappropriate contracting strategy is often seen with the award of EPRD (Engineering, Procurement, Removal and Disposal) contracts. Operators can require a firm fixed price for poorly defined scope, scheduled to be executed in one to two years in the future. In this situation the EPRD contractor, and often their subcontractors, are required to assume the risk of changing market rates for personnel and equipment, fuel costs, consumables, services, foreign exchange rates and scrap values. Movements in these areas can very quickly erode margins and potentially put smaller companies out of business. The bidding process used is also often flawed. Recently an operator requested bids from no less than eleven subsea contractors for a single project. A one-in-eleven chance of winning a bid will be reflected in a reduced effort to prepare, and quality of, the proposal. This approach is contrary to recognised good practice and can result in receiving bids from the least qualified and capable contractors, at a price none others are willing to contemplate. The recent Oil & Gas UK Tender Efficiency Framework publication is an excellent report laying out how efficiencies can lead to double digit cost savings through improved tendering, minimisation of duplication and enhanced behaviours. A preferable approach may be to complement the tendering process with the use of competitive dialogue, where discussions are held early in the process between the operator and the contractors. This enables the introduction of ideas, innovation, new technology and efficiencies from the contracting community, designed to address the true problem, rather than match an operator-defined method and scope. Bidding can still take place with a smaller number of qualified contractors as a conclusion of the process. There does not appear to be a logical UK national port strategy in place today. The vast majority of UK ports are in privately owned and financed. The UK Government support this and do not interfere in this market place. 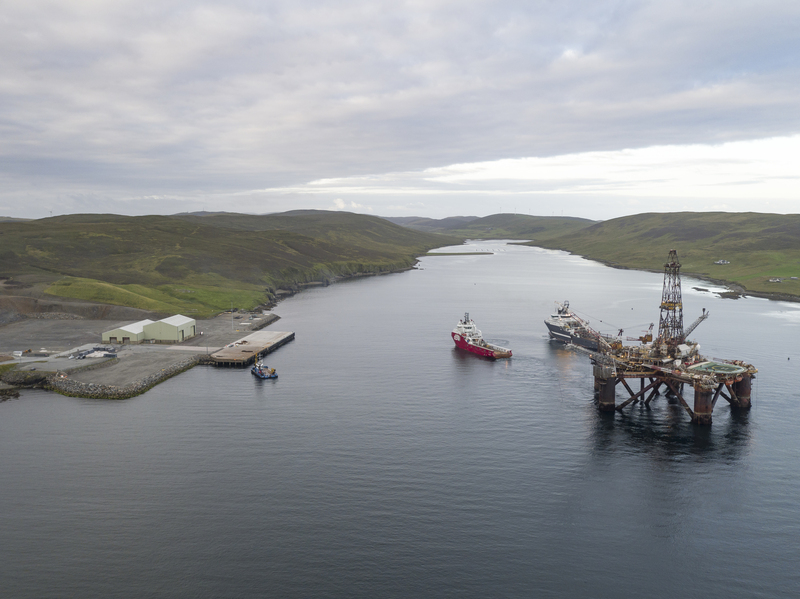 Investment for decommissioning is particularly prevalent in the east coasts of Scotland and England, and Shetland and most of this investment is to complement existing port business and not a sole focus on decommissioning. Publically owned ports require public funds to support investment and therefore need to be creative in their investment plans to attract public sector borrowing. In spite of the existing capacity in private ownership and the relatively small value in onshore dismantling as part of the decommissioning scope (approximately 2%) many commentators, including political parties, are calling for large capital investment in an ultra-deep water port in the UK. There are a number of existing deep water ports in the UK and they are currently securing a significant portion of the onshore dismantling work scope. The business case for a £100 million public investment in an ultra-deep water port is questionable at best, and possibly non-existent. Not only is the return in investment very small, it would be in direct competition with successful private investment currently underway. Also, the UK does not need one to be successful in decommissioning. Should the UK undertake decommissioning alone, or would it not be preferable to collaborate with our North Sea neighbours? This would create a regional centre of excellence in the decommissioning of hydrocarbon basins; a capability that would be exportable to other geographical locations. The participating countries of the UK, Norway, The Netherlands and Denmark could all benefit from true collaboration and best use of the regions’ natural resources, expertise and experience. This may result is some dismantling projects and other elements of work scope going overseas, but is this really a problem, given the bigger prize? Collaborative, complementary working relationships across the work scope are beginning to emerge. The existing arrangements with Petersen/Violia, Jigsaw in North East England and the proposed joint venture AF Dundee are good examples, and others are in the wings. Collaborative behaviours and positive contractual and commercial arrangements are also beginning to emerge and evolve in the well abandonment area with the arrival of Well Safe Solutions, and others. These relationships are creating cost saving synergies and are attracting the attention of operators. This will help facilitate true campaigning, as advocated by the OGA and others. It is also encouraging to see a growing number of new market entrants, who are more likely to bring and exhibit appropriate commercial and contractual behaviours, more suited to decommissioning. There is often a call for a true decommissioning industry, fit for purpose, focused on the task at hand, and free of the investment project behavioural legacies. This is beginning to happen. This change is currently being driven by new market entrants, but it is never too late for incumbents to adapt and contribute to the UKCS decommissioning success story.